This Christmas I am pretty sure M&I are going to have a little more on our minds than elaborate Christmas decorations (in case you haven’t been ticking the time we have a little over two weeks until the due date). 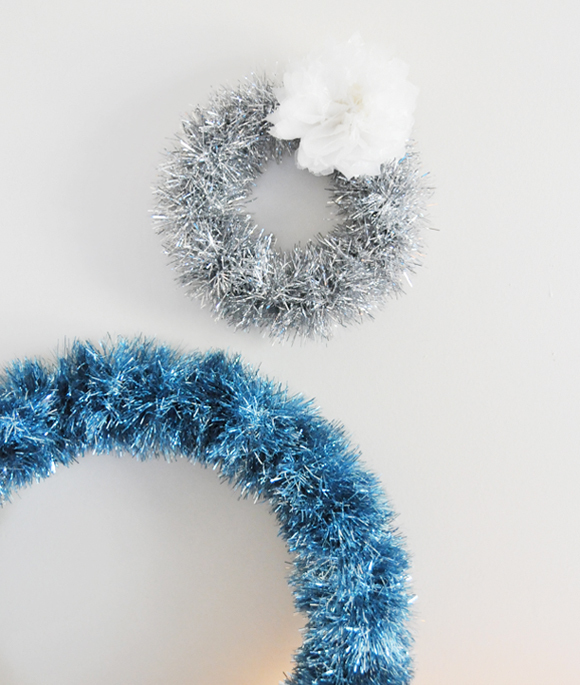 I am a sucker for Christmas so I would like to have something and this 5 Minute Tinsel Garland Wreath seems like just the ticket. I already have the hoops and getting garland should be a snap. I even have some fancy garland that will dress these wreaths up nicely without pulling out all our ornaments. It is almost like instant gratification and will certainly add a little sparkle and Christmas cheer to the apartment. Thanks for the great tutorial, Ez! Next Post Where Am I? ?